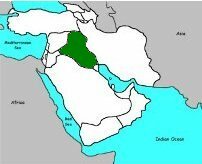 Divisions: Iraq is divided in eighteen governorates (like provinces) and the autonomous region of Iraqi Kurdistan in the north. 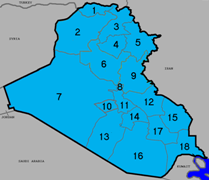 The largest three governorates by population are Baghdad, Nineveh, and Basra. The largest three by area are Al Anbar, Muthanna, and Nineveh. Description of flag: The Iraqi flag was adopted on January 22, 2008. It has three horizontal stripes of red (top), white (middle), and black (bottom). These are the same colors as the Arab Liberation Flag. In the center of the flag is green writing stating the motto of Iraq "Allahu Akbar" which means "God is Great." Origin of the name Iraq: The name Iraq has been used for over a thousand years. Some say the name comes from as far back as the Sumerian city of Uruk. The region of Iraq around the Tigris and Euphrates Rivers has been known as Mesopotamia and was home to some of the oldest civilizations in history.